I used highlighters to color code on my report sheet various things that needed to done and info about pts. I designated different colors for different things. For example, a pink highlighter dot means the pt is diabetic. A pink check mart next to that means they are scheduled for routine finger sticks. Yellow means pt has a foley. I would make two short yellow lines- one for I, the other for O- and fill in the yellow lines with the amounts for my charting and report. A green mark means wound care/dsg change needed, and so on. The hours and pay at the SNF do sound really good. A SNF is a really good place to hone your skills- as long as it is a good place to work. Lots of various different kinds of pts @ a SNF. Not all are elderly. I know two people who have worked there- both left recently. They only had bad things to say. 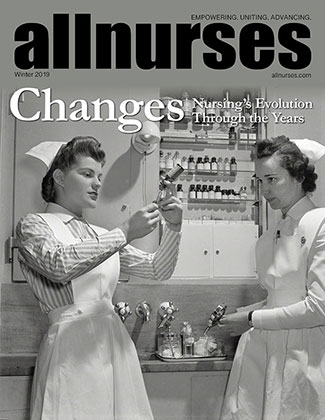 Parts of Texas have been saturated with nurses for a long time. There were plenty of jobs in the large, metro areas in the past, but that is changing now. I worked at an HCA in Texas. Worst experience of my career. However, every place is different. Just be careful. Watch your back, CYA, and mind your Ps and Qs. Be friendly, but don't reveal too much about yourself. Any VA Hospital employee's here familiar with the system? I would think that the best thing to do would be to approach your doc again, telling her that this is very important to you, and you really want her to take some action on this. If she is a good doc, she will surely be responsive. It sounds like the pt had a vasovagal episode. She may need a stool softener to prevent this. I still get teary after all these years when I see a pt suffer. Don't worry- it's normal. Finally- an accurate article. And this is in Texas- the supposed "land of opportunity" for nurses. Can RNs really make this much? I have been offered travel jobs to HI, but the pay has never been more than $19./hr- less than half of what reg staff makes per hr there. The agencies' take on it is that travel nurses in HI are "paid in sunshine and beach." Sorry, but sunshine and beach don't pay the bills. Great advice! As a new grad, I had a "preceptor-ship" that was really an after-thought. The "preceptor" had no desire or education to be a preceptor, and was pushed into it by mgmt. She was very resentful. My orientation there was awful. Of course I left. This morning I was watching HLN news. There was a wonderful story about an American nurse who is there helping the earthquake victims. This nurse has been an amputee since she was 19. She is using her own experience for pt teaching & support to help new amputees in Haiti. Because of the earthquake, the current generation of young peopl in Haiti is being referred to as the "amputee generation." I googled, but could not find any more news about the nurse. Hopefully, something will pop up- I'd love to read more about her. How do you know if you're cut out to be a nurse?? I showed your list to my dh and he said "Did you write that?" Lol! I've never met a staff RN making more than $24./hr in Texas. I agree, but I'd take the $50. !